Can We Compare Kate Moss and Cara Delevingne? Kate Moss has joined forces with Cara Delevingne for Burberry, could this being a passing of the model torch? They’ve been friends for a while, but Kate Moss and Cara Delevingne have now done what they do best together, modelling, in the latest Burberry fragrance campaign. Now we all know queen Kate has held her fashion crown for well over two decades, but could young Cara be next in line to her throne? Whether the torch is passed or stolen, is Cara Delevingne the next Kate Moss? 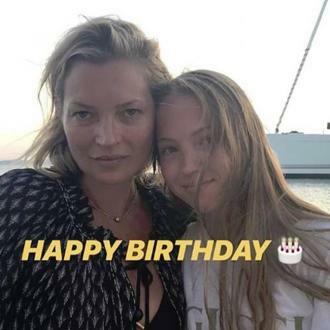 In January Kate Moss turned 40 a landmark birthday, which also meant celebrating 26 years in the fashion business for the supermodel. Not bad, considering models often have a very short shelf life. But Kate’s 26 years at the top haven't all been smooth sailing, there’s been failed relationships, plenty of scandals and even a few contracts lost along the way. Still the fashion world can't get enough of Kate Moss. Her unique appeal has meant that changing in trends and fads have done nothing to stall her career. She’s the chameleon of fashion who can advertise everything from clothes to mobile phones. We watched her walk the runway for all the top names, grace every magazine cover and seen her image on countless billboards and it all doesn't look likely to stop any time soon. Cara, on the other hand, is still a relative newcomer to the fashion game. Yes we’ve seen her on the runway for Chanel and Burberry and she’s had her fair share of glossy mag appearances, but Cara's still yet to reach true supermodel status. Though her greatest champion seems to be Chanel creative head, Karl Lagerfeld, who recently said of the 21 year old, ‘girls admire her like they used to Kate Moss. They all want to be as free as her.’ An endorsement from Karl of course is as good as it gets in fashion, but even if the youth are now looking at Cara as their model of choice, Kate may not have that much to worry about yet. Despite their twenty year age gap the model pair do actually have a lot in common, namely that they were both the discovery of the same woman, Sarah Loukas. Sarah famously discovered Kate at JFK airport back in 1988 when she was just 14 years old. Kate’s Cinderella scouting story led a whole generation of young girls to hope that someday they would be ‘discovered’ while out and about and then achieve worldwide fame. Cara’s discovery, 20 years later, was left a little less to chance. Coming from a wealthy family, Loukas first hired her sister Poppy but her eyes soon turned to the younger Delevingne and her now famous eyebrows. Like Kate Cara’s also had her fair share of tabloid column inches so far in her short career. Most notably there was that suspicious dropped bag incident back in August 2013. The mini storm of controversy led to her being dropped by H&M. Of course this is all nothing compared to what Kate went through back in 2005 when her cocaine scandal hit. Kate might have lost a few contracts in the immediate aftermath, but she soon returned right back to the top of the fashion pile. There’s also been high profile romances for both girls, Kate with Johnny Depp and Peter Doherty and Cara with Jake Bugg and Harry Styles. Indeed much like Kate did in the 90s with her Primrose Hill set, Cara has cultivated her own ‘cool’ gang of friends to be seen partying around town with, including Styles, Rita Ora and Rihanna. However much similarity can be found between the two model’s careers, even at Cara’s early stage, there will always be one vast difference. The world in which Cara has built up her own model brand is vastly different from the one that spawned the iconic Kate Moss. Cara’s world is built upon accessibility and sharing on social media. She’s a tweeter and an instagramer who doesn't mind sharing aspects of her personal life with the world. Kate’s relationship with the public is very different. Indeed much of Kate’s longevity has come from the mystique she’s built up around herself. She rarely gives interviews, often citing the advice ex boyfriend Johnny Depp gave her, ‘never complain, never explain’, as to why she’s so quiet with the media. Kate doesn't let us into her life, instead she lets us build up our own fantasy image of her, preferring to keep her true self well hidden. Posing with Kate Moss for the Burberry campaign is certainly a good move on Cara’s part. What young model wouldn't want to rub shoulders with queen Kate? Still let's hope she's not expecting Mossy to give up her mantel anytime soon. Cara might be good, for now, but as for how she compares to Kate Moss? You’ll have to ask us again in twenty years time, when sadly the answer might just be, Cara, who?